2017 DDSJ Festival Lineup - Western Region Puerto Rican Council, Inc.
With each generation, new artists release an innovate fresh styles of music. Salsa, however, is a genre that has remained untouched and current for decades. Thanks to the combinations of unshakable historical legacies and the contributions that always bring new exponents. 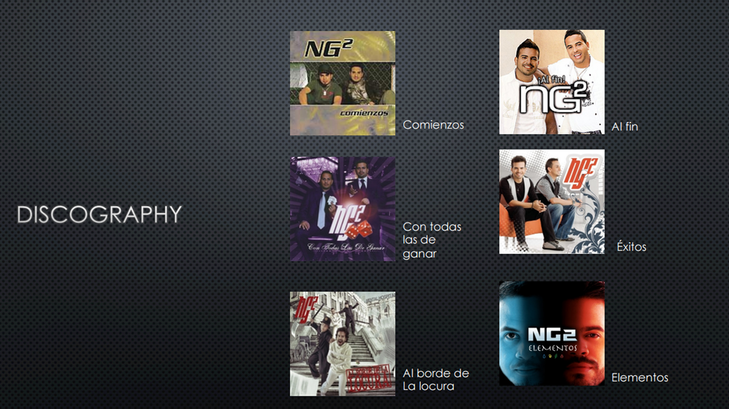 Exponents like NG2, an acronym for "new generation" plus the number of members in the group. The letters also represent the names of its members, Norberto and Gerardo. Young songwriters and musicians who respect tradition but are not limited to it. They are inspired by their roots, but they make the music evolve with their own personal touches. El Gran Combo, not only a clear influence of the music sound of NG2, but also shares a relationship that goes beyond creativity. Gerardo's father is Jerry Rivas, lead singer of the famous Puerto Rican ensemble led by Rafael Ithier. "For me, it is an honor to have the legacy of El Gran Combo," says Gerardo. He admits that it is a big weight on his shoulders, and a large responsibility, to be linked to El Gran Combo. Both Gerardo and Norberto put into practice all the advice given to them by Rivas and the legendary Ithier. They ignore the criticism and continue to work hard at their craft. "It's a compliment that they believe in our careers," reflects Gerardo. "And one of the things we're going to show them and the public is that we're never going to let them down." Norberto agrees hole heartedly, son of Heriberto Velez, who led a Puerto Rican music group, to which Norberto was a part of. Norberto, a native of the town of Hatillo, Puerto Rico, began his music career at the age of four or five. He sang at school, competed in festivals and sang with his father's group. Heriberto Velez was also a music teacher. Norberto sang traditional music until seventeen years of age, then switched it up and focused on a more popular music sound of that time. Gerardo, a native of the city of Bayamón. Puerto Rico began his music career at age of ten leading a children's group called Gerardito and Los Rockolos. A combination of the words rockers and cocolos, two categories used to classify lovers of rock and Salsa in Puerto Rico. As a teenager, the future artist would study percussion at the Libre de musica of Puerto Rico, where he would meet Professor Santiago "Chago" Martínez, who also worked as Director of the orchestra of Víctor Manuelle. 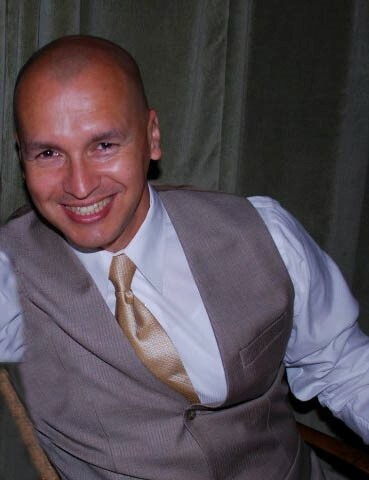 During his first months with the famous salsero, Gerardo was a backup singer, soon to be a percussionist in the group. It was during that time he would meet Norberto. 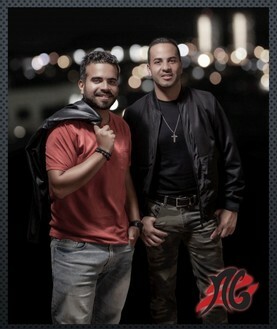 With the support, push and collaboration of Victor Manuelle, Gerardo and Norberto would join forces to form the group NG2 and perform and demonstrate to an avid audience that they have what it takes to be on top of their game! ​Gerardo Rivas was born on July 21, in Bayamón, Puerto Rico. Since childhood, his passion for music was evident. His father Jerry Rivas, a member of El Gran Combo Salsa group, took him to the band activities and his passion for Salsa music grew. One day his father and mother Yolanda Vivas propose to Gerardo to make a musical group for his generation. An idea that ​Gerardo quickly took to and soon he became Gerardito and the Rockolos. That experience for Gerardito, as he was referred to by friends and family, was amazing and he knew what he wanted to do with the rest of his life.Gerardo attended Libre de musica school of San Juan, Puerto Rico where he evolves as a musician and a skillful percussionist. Once he graduated at age of nineteen, Gerardo becomes a part of the Orchestra of Víctor Manuelle as a percussionist where he met Norberto Vélez and that is when they formed the group NG2 and the rest is history. ​Norberto Vélez was born on August 20, in Rio Piedras, Puerto Rico. Before taking his first steps at his residence in Hatillo, Puerto Rico, Norberto already showed signs of his artistic music vein. His first music teacher was his own father, who taught at the Escuela Libre de Música and the Universidad Interamericana of Puerto Rico, in the town of Arecibo. During his childhood, Norberto showed interest in learning to play various instruments, of which the guitar was his favorite. For about ten years, Norberto, always accompanied by his parents, began performing his first musical performances, interpreting the typical music of his homeland while playing with Conjunto Tipico Clasico and Conjunto 4x4. At the age of seventeen, Norberto joined the Orchestra Trovadores as a Trumpeter, directed by Conductor Elías López, where he began to feel a great passion for his salsa roots. During this time, he had the opportunity to participate in the chorus with various artists such as Kevin Ceballo, Frankie Negrón, Carolina La O, Pedro Brull, among others. After about three years, he had the opportunity to accompany the band of Victor Manuelle. Hermenegildo " Herman " Olivera Jr. was born to Puerto Rican Parents on January 30, 1959, in Newark, New Jersey. He began singing at the age of twelve & by the time he reached fifteen, he was singing with various local groups. It was at one of these engagements where Manny Oquendo, Andy Gonzalez & Pupy Cantor were struck by the young singer's vocal talent as well as his charismatic stage presence. It was just a matter of time before he was offered the chance to be behind the microphone in front of Manny Oquendo's "Conjunto Libre" with whom he recorded five albums & had a string of hits like "Decidete", "No Me Echen La Culpa" , "Que Humanidad " & "Tu Me Perteneces" among others. After his tenure with "Libre", Herman went on to work regularly with "Johnny Pacheco" for a few years & also frequently worked with "Ray Barretto", "Bobby Rodriguez Y La Compania " & "The Machito Orchestra". He also participated in the "Israel Cachao Lopez" documentary produced by Andy Garcia, titled "Como Mi Ritmo No Hay Dos". 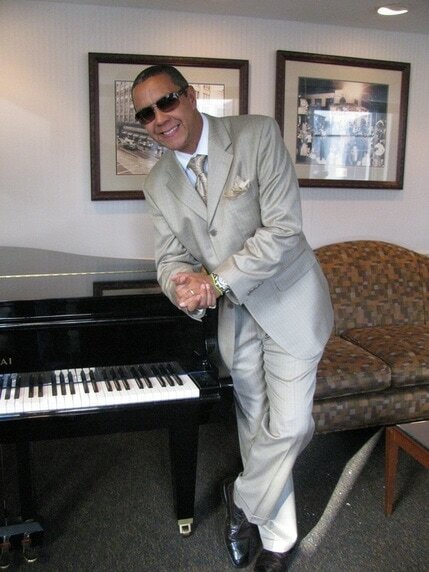 Herman Olivera is featured as lead vocalist on thirty-one productions to date, including one solo recording " Chequea La Mercancia " & has collaborated with many mainstream artists on a number of projects. This dynamic SONERO is currently the lead singer of the "Eddie Palmieri Orchestra" , where he is featured on the last five CD'S with the eight-time Grammy Award Winner & Master Pianist including "Masterpiece/Obra Maestra" with the late, Great "Tito Puente". Herman Olivera is considered by many, as one of the very few SONEROS left in the true salsa genre. He has & continues to tour all over the world, appearing as a featured vocalist in many prestigious festivals, T.V. shows, etc., including stints with The Carnegie Hall Jazz Band & The Lincoln Center Afro-Latin Jazz Band. It has been noted that this brilliant vocalist has all the essential qualities of a great singer: diction, vocalization, soul & feeling which combined with his charisma & the palatable timbre of his voice, projects the well-seasoned mixture of the Afro-Caribbean rhythms. Without a doubt, Conjunto Alegre is one of the most exciting and truly refreshing new bands to hit the streets of San Francisco and the Bay Area. This extremely, talented group of musicians offer salsa enthusiasts and aficionados, their very own unique fusion of modern Salsa combined with deeply rooted traditional “Musica Jibara” creating “Salsa Jibara”. It is Puerto Rico’s national instrument, the beloved “Cuatro” that lends to the rich homestyle “Jibaro” sounds of “La Isla” and days of long ago, on Conjunto Alegre’s debut CD “Cuando Me Toque Partir”, giving birth to “Salsa Con Cuatro”. 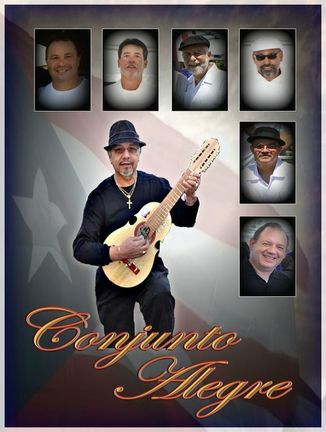 As a Puerto Rican band “Conjunto Alegre” is dedication to sharing and promoting Salsa Jibara, as well as music from the Caribbean in general, for the listening and dancing enjoyment of the diverse communities of the world. 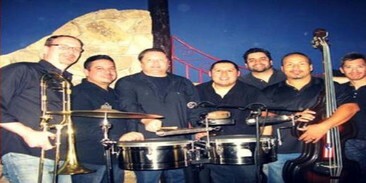 Some of the traditional styles of music Conjunto Alegre offers aside from Salsa are plenas, bobas, merengue and other world rhythms. The group which was originally formed in Vallejo, Ca, in 1979, includes members from Hawaii, Puerto Rico, and San Francisco. JERI QUIÑONES originally from Vieques Puerto Rico, is a local percussionist that, for almost 30 years has worked with most of the local groups of tropical music the San Francisco CA Bay Area. Also accompanied international artists of the “salsero” environment and other genres in many occasions. Currently belongs to “Orquesta pal, Vailador” directed by Neftaly Rosado, as alternate with other groups. 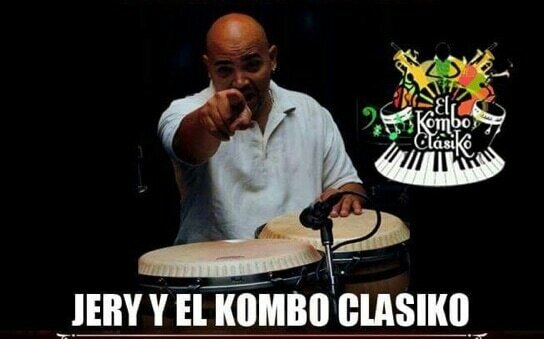 In the year 2013 he decided to assemble his group under the name of “El Kombo Clasiko” as a tribute to some of the “salseros” of the golden era of the 70's & 80's. Kombo Clasiko has an expensive repertoire of the music of Ismael Rivera and The Cachimbos to whom Jeri mostly renders homage the Kombo. Santos Lopez is an avid “Salsero” (Salsa dancer) who has maintained a passion for Salsa dancing since he was first introduced to Salsa in the early 1990s. Santos began DJ’ing at the age of 15 and has maintained the art ever since. Santos has DJ’d at several Salsa venues around the Bay Area and at various outdoor events, including the WRPRC El "Dia De San Juan" Festival and Redwood City Salsa Festival. He has also been the main Emcee for the San Jose Jazz Summer Festival Salsa stage for the past 6 years and has worked closely with several local Bay Area Salsa bands. Angela Tirado is a local A capella vocalists from east side San Jose. She enjoys sharing her God-given talent with her community. She has been named "The Voice of San Jose" by San Jose City Council and the Mayor.